Do you remember Coco? She and her book series were introduced by Lilly Diabetes and Disney at Friends for Life in Orlando last year. Coco has since been received warmly by many and received wonderful reviews. Yesterday, at the Lilly Diabetes Summit held at their corporate center in Indianapolis, stories about the impact that Coco has had were shared. A young, newly diagnosed girl was able to comfort her worried parents after reading the book and tell them she was going to be okay. Grandparents living with diabetes have used the book to explain what diabetes is to their grandkids. The overwhelming opinion of those at the meeting was that Coco’s story is a wonderful way for kids to feel better about living with diabetes and to help others understand what it means. This picture book really stands out as THE book to get the message across to kids. Not just newly diagnosed kids, but all kids. 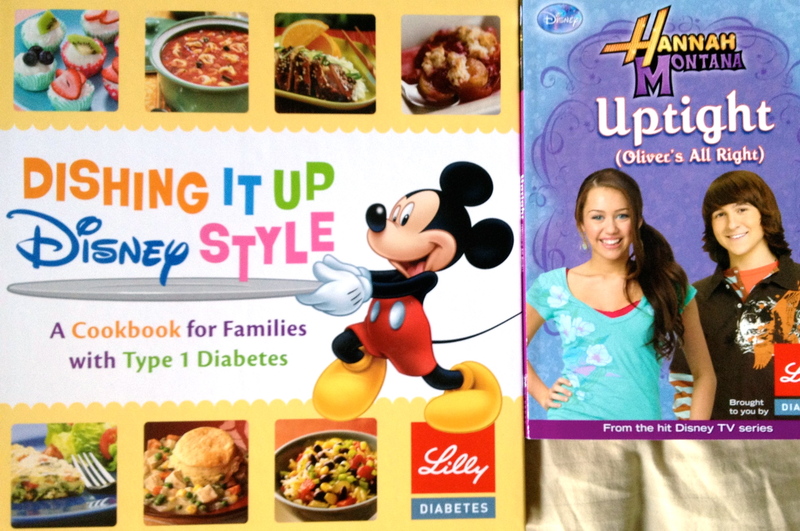 In addition to the Coco book, the Lilly Diabetes/Disney collaboration produced the first two books of their tween series. One is titled Power Forward, featuring newly diagnosed Justin, and the other is Up for the Challenge, featuring newly diagnosed Allie. 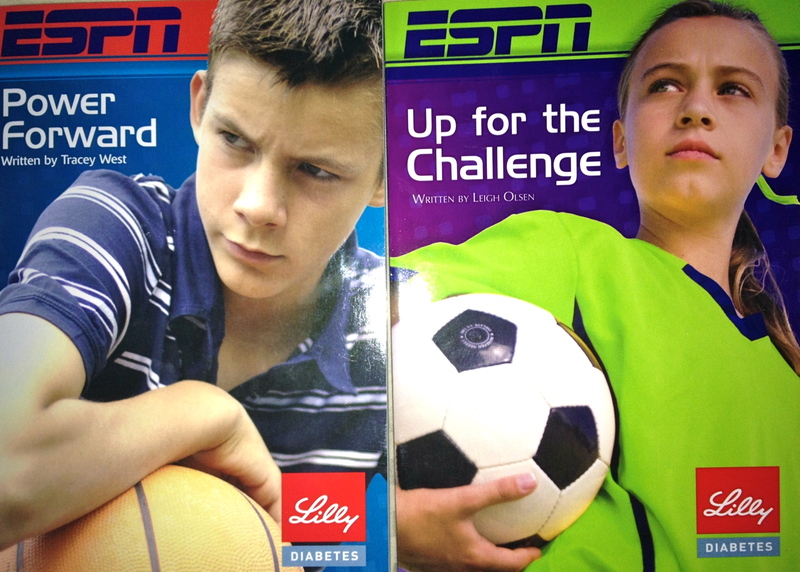 Both have a sports focus which is clear from the picture and the inclusion of “ESPN” on the cover. Both books are about middle schoolers who are very skilled athletically and play key roles on their sports teams. The main characters are new to diabetes and their biggest difficulty seems to be telling their friends about it. Other issues come up, but the central theme is whether and when they will share the news of their diagnoses. These books are great for newly diagnosed kids. I don’t know of anything else out there like this available for kids of this age. I think the characters are relatable, the issues are authentic and the message of what it means to be living with diabetes are, for the most part, properly portrayed. The struggles featured for these characters were more emotional as opposed to physical. For tweens that may indeed be the priority at first. The books are not intended to be a fully inclusive depiction of every issue a newly diagnosed person is presented, nor are they meant to be medical advice. There were times that both characters’ blood sugars went low due to activity – managing sports with diabetes is a focus for both books and hypoglycemia is a real issue we see often when Caleb is active. I found myself anticipating an out-of-range blood sugar at one of the many times the characters responsibly checked their bg. It might be better to say I was actually rooting for an out-of-range blood sugar to see how the story would address it because so many other things were being portrayed well. Those opportunities were few. I worry that a newly diagnosed person would read this and think he/she was doing something wrong if their numbers weren’t as in range as these characters’. Caleb read Power Forward and Lila, who is 6 and does not have diabetes, read Up for the Challenge. They both enjoyed the books. The stories kept their interest. Lila has been inspired to become a soccer player. Neither of them are the target audience so the impact would be better measured from someone who reads them just after being diagnosed. Nevertheless, the stories do stand alone as just good stories. Lila sought out Up for the Challenge to read a second time just because she liked the theme of friendship. There was clearly purpose in the writing of these books. At the end of each there are questions to think about, like – did you feel the same way about having to wear a medical alert bracelet? Or – when you went back to school did you feel differently? I think that is a really great tool for parent and tween to start discussions to get feelings out there. I think that’s very valuable right after diagnosis when it can be hard to focus in on all the emotions you are experiencing. I was happy to hear that these books are not the end – we were presented another tween book, a family cookbook and the promise of another sports oriented book soon on the way. 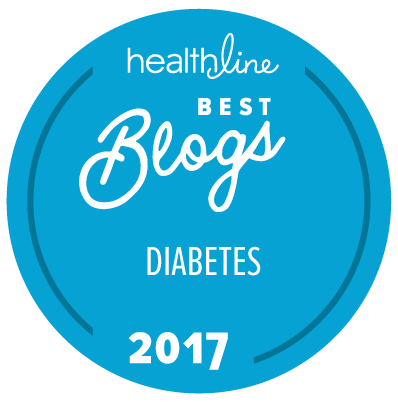 What I saw and heard from the Lilly Diabetes people both last year and this year was a desire to understand what they could do to make things better for people with diabetes on the emotional side. Creating these books, when there is nothing else out there like them, in the authentic way that they have, I think is a great way to do it. I hope they will continue with books focused on some of the other issues our kids deal with through the varied stages of living with diabetes. I know what you’re going to ask – “Where do I get these books, Lorraine?” Distribution is through endocrinologists’ office. Lilly Diabetes’ hope is that this will provide a link from real-life issues to real-life medical solutions with the proper medical personnel. Please ask your child’s doctor, and if they don’t have them, please have them ask their sales representative. Lilly Diabetes invited me to attend an event at their corporate center and paid for my airfare, travel, hotel and meals while I was at the event. I was not asked to write about the event and the opinions expressed herein are my own. A special weekend post for Mother’s Day thanks to DiabetesMine.com. I wasn’t familiar with this series of videos before Amy contacted me. I got a chuckle out of them. My “mom of a D-Kid” version doesn’t quite measure up, but I am so thankful for the response it’s gotten – thank you! For all moms who will do anything to support, advocate and love their kids above all else, particularly my mom, from whose example I have learned how to do this, this is for you. My good friend, Tony, of Blogging Diabetes, asked to chat with me for his Podcast today. I told him he was crazy, because I’m a babbler, but he still went through with it! I only wish I didn’t babble so much and Tony spoke more. I’m going to reveal the special surprise Tony had for me at the end – a short little interview with Caleb. I had no idea. It was so nice to hear the two of them chatting. Caleb, however, is nice and succinct, not like his mom. So if you dare, I invite you over to Tony’s blog, if not to listen to me, to listen to any of his amazing podcasts, and if nothing else, check out his great video on standard deviation! Normal blood sugars are seventy to one-forty. His reach forty and four hundred. His average is “acceptable” and we celebrate. But the reality is, his body is strained. His nervous system, vision and heart are always challenged. Seizure, coma and even death are real risks every single day. He is a human pincushion. Forced to bleed ten or more times daily. He wears his pancreas on the outside. He must tell it what to do all day long. Even when he sleeps. He must visit the school nurse throughout the day to deliver insulin and check his sugar levels. He must leave class when he doesn’t feel right. He must measure every single thing he eats. With all this effort, it still ravages. He feels “out of it” and “wobbly”. I feel guilt and like a failure. He feels “woozy” and “foggy”. I feel irritable and anxious. I failed again. For the sugar to work. For the insulin to work. Every day. Throughout the day. His eyes, his kidneys, his legs, his heart. Night after night, I check his blood sugar while he sleeps. I wake with a number in my head – his last blood sugar. Midnight. Three AM. Six AM. It’s time to check his blood sugar with the school nurse. I worry, with the phone in my hand. It’s time to get back on the bus. Still worried. Still have the phone. We put on smiles. Brave faces. No use dwelling on the negative. He eats birthday cake; celebrates Halloween. But it still ravages. His body and my mind. I want the ravaging to stop. I wrote this about three years ago, two years after Caleb’s diagnosis when I was still adapting. He was in kindergarten and it was a tough time. I wrote it as therapy – to get my emotions out, while I was still putting up a front that everything was okay. I shared it only with one person – a close friend; another Dmom. But otherwise, I wasn’t willing to let people look inside. It was all too raw then. I read this now and I still relate, but I no longer break down in despair. I’m on the other side of something – not sure what. But things are less painful. I still want it to stop, but I now know that no matter what, we will get through. We will persevere. Caleb has shown me this. It’s him. His spirit, determination, unwillingness to let diabetes get in his way of what he wants to do. He is the rock in all this. He has brought me to the other side. The No Sugar Added Poetry® contest is what inspired me to share. New York Times Best Selling author, Brenda Novak, has just opened up this year’s auction to benefit diabetes research. To date this event has raised over $1.3 million. There are LOTS of nifty things that I will be watching and I invite you to bid away! 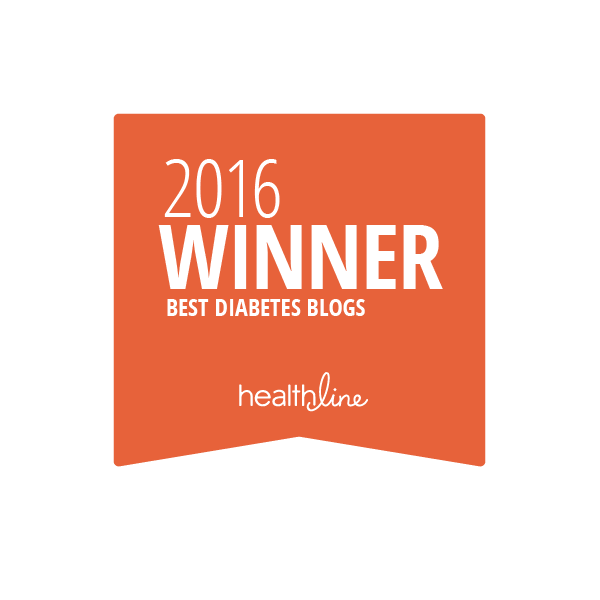 Today DiabetesMine.com announced The DiabetesMine™ PATIENT VOICES CONTEST. 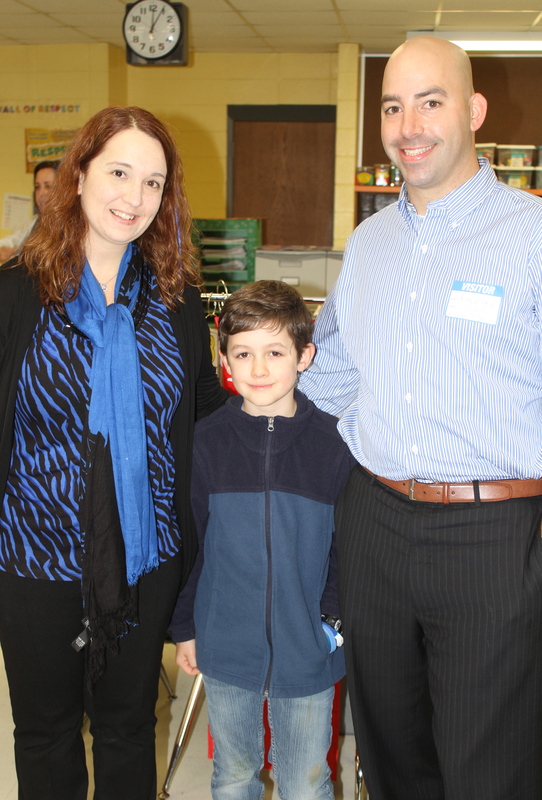 For the past three years we have celebrated World Diabetes Day as a community at Caleb’s school. Each year has been a little different. 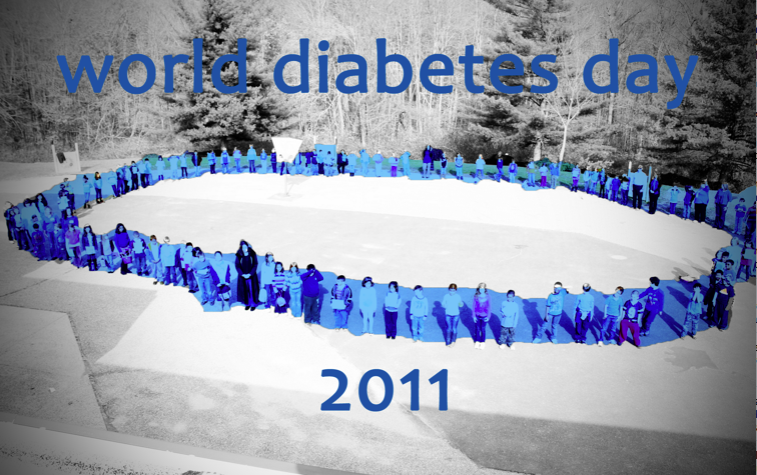 There were three things that made 2011 unique: supporting Team Type 1, making a human blue circle and meeting Mr. B. These were all special nuances to Caleb, but perhaps the most impactful one on this day was meeting Mr. B. He is the husband of Caleb’s teacher. He came in to visit with Caleb just for World Diabetes Day. Caleb and Mr. B. both love baseball. They are both fans of the New York Yankees. They are both living with type 1 diabetes. I went into school during Caleb’s lunch period while his awareness video was being shown. I saw Mr. B chatting with Caleb. I saw Caleb’s smile. They spoke about baseball. Mr. B showed Caleb his insulin pump. 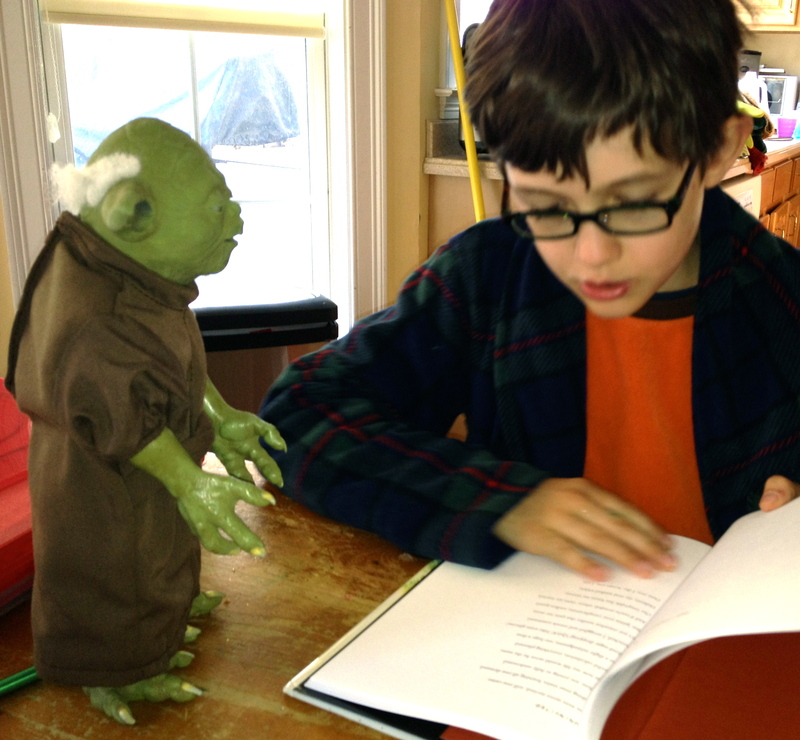 Mr. B shared with Caleb what it was like for him growing up with diabetes. He told him he thought Caleb was brave because he’s so open about his diabetes. Caleb has had a great school year with Mrs. B. Having someone who understands, who is accepting, who isn’t afraid and does not panic makes all the difference in the world for a student with diabetes. Our children cannot help but be singled out at school. There are things that they must do that their peers do not. Things that, despite our best efforts to normalize their school day, are indiscrete. Things that are simply non-negotiable and we cannot change them. Spending his school days with someone like Mrs. B, who gets it, means that Caleb can focus on being a student first. He can focus on his favorite books, enjoy the new world of science uncovered for him, be challenged in his math group, play his violin, and joke with his friends. It lets Caleb just be Caleb. A boy who, like his peers, has many dimensions. 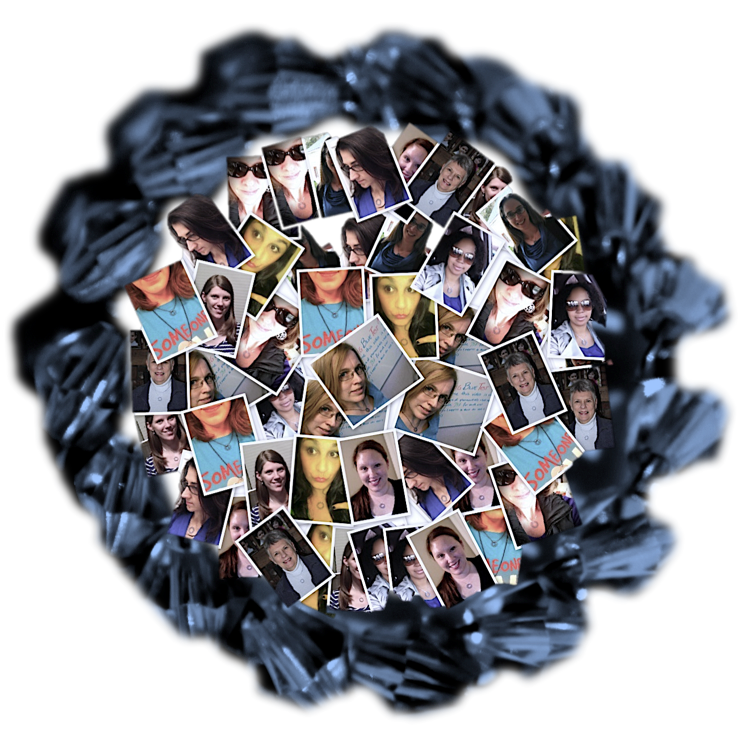 One just happens to be living with diabetes, like his new friend, Mr. B.
Mr. and Mrs. B, Caleb, Lila, Nurse M and Mrs. Muller are in the upper right part of the blue circle. 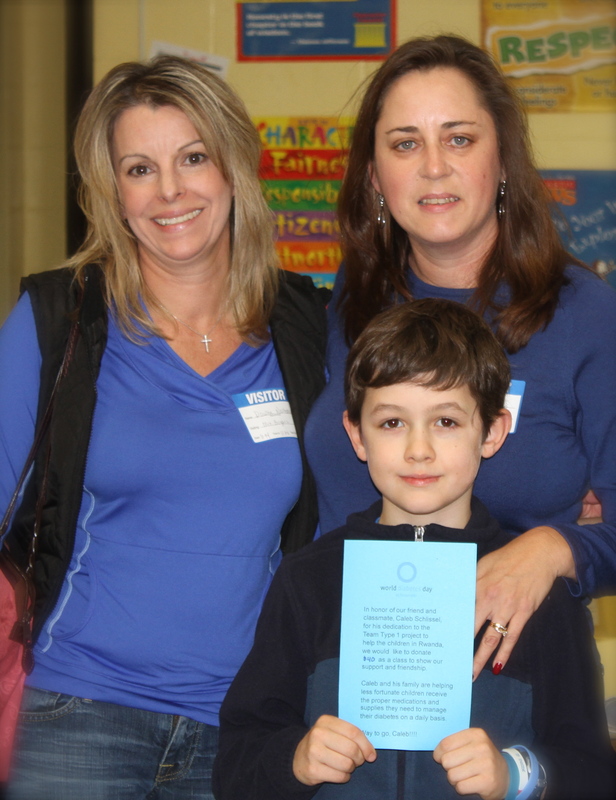 For the past three years, we have held awareness events at Caleb’s school for World Diabetes Day. This year, in addition to asking friends to wear blue, we collected dollars to support the efforts of Team Type 1 in Rwanda. We did our usual – created an awareness flyer and made daily announcements at school. The community answered and we were able to contribute $500 and 600 test strips to Team Type 1’s cause. I was taking care of a few things in conjunction with the awareness video we showed the students and Gigi asked me if I would be heading to the classroom. I said, sure. I was a little confused trying to think of what was happening in class that day that I couldn’t remember. 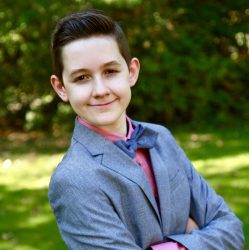 In honor of our friend and classmate, Caleb Schlissel, for his dedication to the Team Type 1 project to help the children in Rwanda, we would like to donate $40 as a class to show our support and friendship. 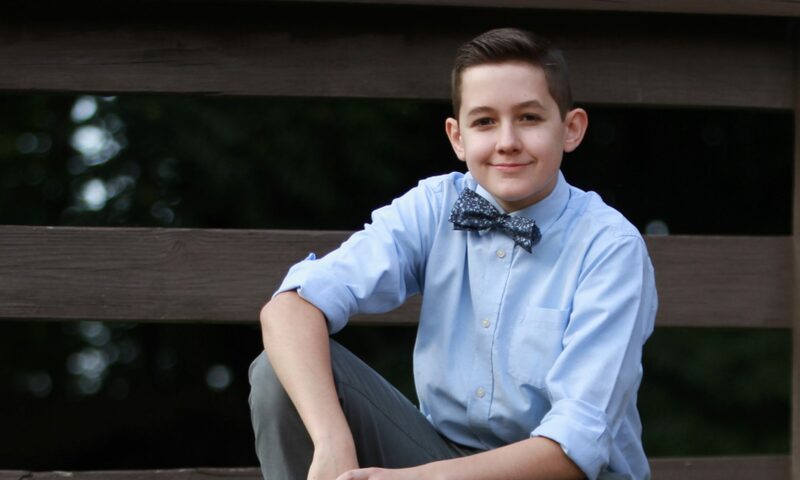 Caleb and his family are helping less fortunate children receive the proper medications and supplies they need to manage their diabetes on a daily basis. We had asked people to wear blue and contribute a dollar to the cause. Caleb’s class raised more than twice that and accounted for the biggest class donation of all the campus. I was so surprised and touched that they would go out of their way and come into school just for Caleb. In retrospect, I really should not have been. They are wonderful moms and good friends. As I sit here today, five months later, I still get choked up by their thoughtfulness. Thank you, Gigi and Dawne, for your kindness and generosity. It is a comfort and a blessing to have you as neighbors and friends. This will always be a special memory for Caleb and me. Of the almost 20 necklaces that are out there, here are ten of them! 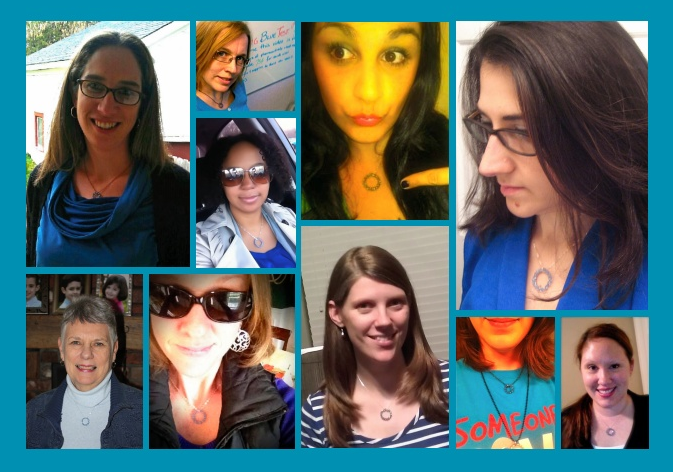 Thanks to everyone for sending your photos, wearing your blue circle and supporting the cause. Through my request for photos, I learned that my mother-in-law recently purchased one! What a treat to see her picture pop up in my in-box! You can get one of your own, hand-crafted by Cari (shown below in the upper right) HERE! 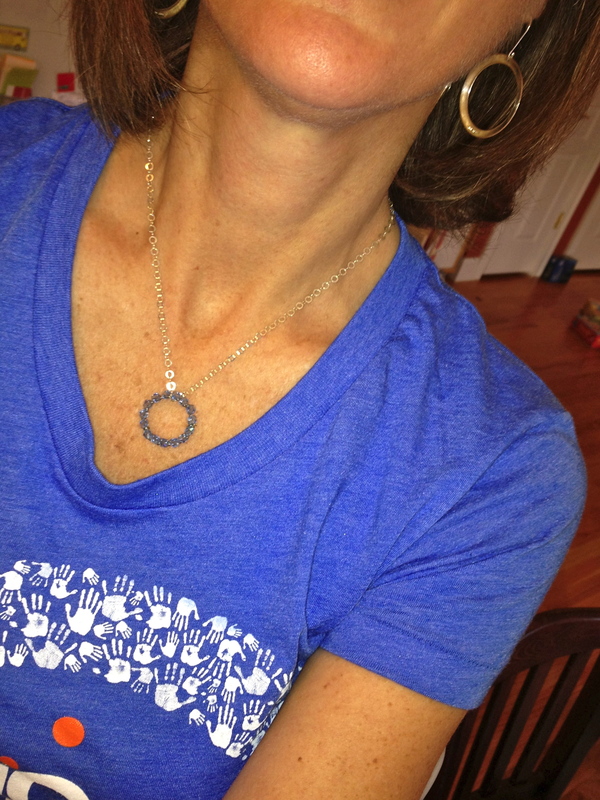 I would love to make a photo collage of all the owners and proud wearers of Cari’s World Diabetes Day necklace. If you don’t mind snapping a photo of you with yours and emailing it to me at storiesofcaleb@gmail.com, I’ll get to work! Don’t forget to do your Big Blue Test! Today is the last day. Whether you have diabetes or not, you can do it and do it multiple times. Each entry mean more than $9 for diabetic people in need.